Atheneum/Caitlyn Dlouhy Books, 9781481440691, 128pp. Sam’s second grade class is studying vegetables. On the day each student is given a veggie, Sam is absent and ends up with the lowly root that no one else wanted—the rutabaga. At first Sam is uncertain about spending time with this seemingly bland and uninteresting globe. However, as the class delves into the science of agriculture, Sam starts to bond with his tuber. In fact, he adds a face with a permanent marker and names his new friend Rudy. Sadly, as time goes on, Sam notices that some of the other students’ produce has begun to wilt. He begins to understand that Rudy will not last forever. So the lad comes up with a plan. With the help of kindly neighbors, his chickens, and his compost, Sam is determined to find a way to keep Rudy around as long as possible. 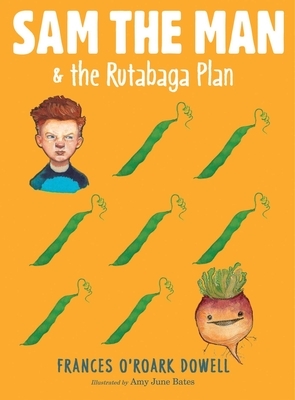 This tale of a young boy using his wits and determination to help a friend, who just happens to be a rutabaga, is both instructive and inspirational. VERDICT With witty dialogue and pleasing illustrations, this second installment will engage younger elementary school readers.